Housepets! Will Do It For Free (Book 6), by Rick Griffin. North Charleston, SC, CreateSpace, November 2015, trade paperback $13.95 (52 pages). Another year passes, and here is the new annual collection of the Housepets! online comic strip by Rick Griffin. Housepets! has appeared each Monday-Wednesday-Friday since June 2, 2008. It has won the Ursa Major Award for the Best Anthropomorphic Comic Strip for every year since! – for 2009, 2010, 2011, 2012, 2013, and 2014. Umpty million thousand furry fans can’t be wrong. Book 6 contains the strips from June 19, 2013 to May 30, 2014; story arcs #70, “Mice To Meet You” to #77, “Heaven’s Not Enough, part 1”, plus the one-off gag strips before and between these. When Housepets! began, the main characters were the dog Peanut Butter and the Cat Grape Jelly, both belonging to Mr. and Mrs. Earl Sandwich of Babylon Gardens. By now the strip has built up such a large cast of pets – Tarot, Tiger, King, Bailey, and many more dogs (dogs), Maxwell, Sabrina, and all the Mr. Bigglesworths (cats), Keene, Duke, Rock, and the other Milton ferrets (ferrets), Zach (rabbit), and nonpet woodland critters – Karishad (fox), Jessica (opossum), Miles, Lucretia, Daryl, the other Daryl, and the rest of the pack (wolves), Falstaff, Truck, and Custom Ink (raccoons), Spo and Squeak (mice) – well, Peanut and Grape have pretty much faded into the background. In Book 6, Squeak demonstrates why she likes bigger cats and dogs. The Gallifrax Dimension turns the bipedal Peanut, Grape, Tarot, and Max into four-legged cats & dogs. Peanut continues to write/draw his “Spot (Superdog)” comic book. Rick Griffin wants to draw anthro kangaroos at the Babylon Gardens Zoo. Prince Jata (leopard) arrives from the African micronation of Feraga to marry Sabrina, and Fido the police dog declares his love for her. (A dog in love with a cat — §gasp§). Jata and Fido duel for her hand. Jessica the opossum risks freezing in winter snowdrifts to save the life of Tiny Tum (raccoon child) at Openermastime. The wolves’ lupine sense of humor is not appreciated by humans. Peanut, Grape & friends imaginate Agatha Christie’s And Then There Were None. The demigods present Valentine’s Day. Itsuki the tanuki exchange student from Japan only appears in one strip this year. The wolves tell stories. “Tiger’s [dog] Very Own Super Special Television Show!” (He’s upstaged by Chauncey, the Robot Penguin.) Book 6 concludes with “Heaven’s Not Enough, part 1”, in which Pete the demigod griffin appears to both King and his wife Bailey (dogs), turns King from a Corgi back into a human (Pete claims that his original transformation spell just expired), Bailey agrees to become Pete’s avatar in Heavenly battle to save King, and Cerberus the giant three-headed dog (another demigod) sends everyone to Heaven to see how things work out. Part 1 is complete, but ends on a cliffhanger. This is the first Housepets! collection that ends on a cliffhanger rather than a story arc’s conclusion. Book 6 presents four rows of strips to a page in full color, with some brand-new illustrations to make story sequences come out evenly. Like all long-running comic strips, this assumes that the reader is familiar with the characters and their backstories. Fans of Housepets! should certainly get Book 6; reading it is much easier than reading the cartoon strip-by-strip on its website’s archive. 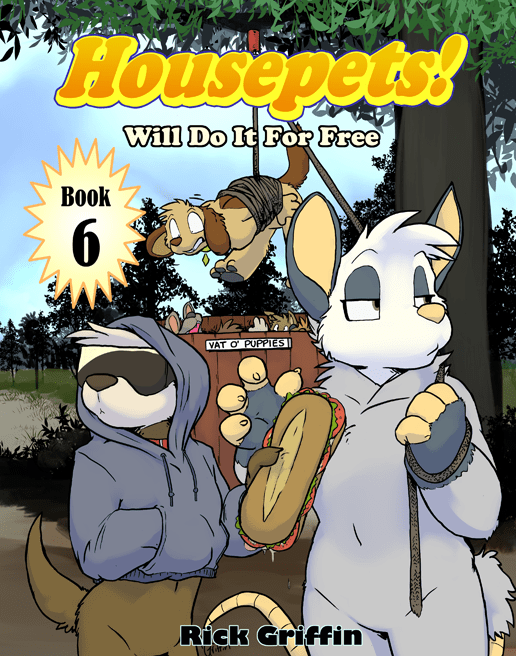 For those who are not already fans, it’s recommended that you start with one of the earlier volumes to get familiar with the cast: Book 1, Housepets! Are Naked All The Time; Book 2, Housepets! Hope They Don’t Get Eaten; Book 3, Housepets! Can Be Real Ladykillers; Book 4, Housepets! Are Gonna Sniff Everybody; and Book 5, Housepets! Don’t Criticize Your Lovelife. They’re all great, and they’re all still available on Amazon.com. Check out the webcomic here.